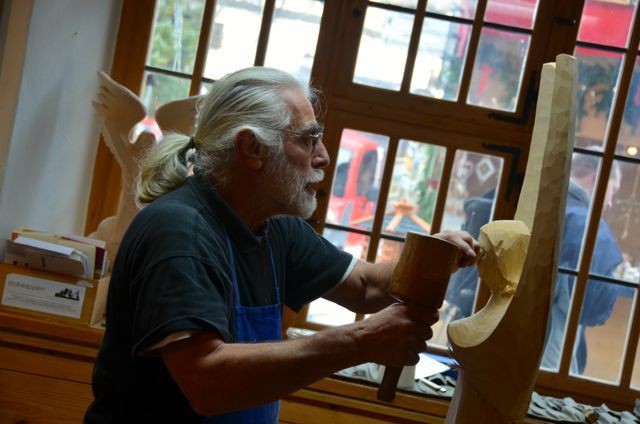 Since Oberammergau is renowned for its woodcarving, I particularly enjoyed watching the woodcarver / Schnitzer, Karl Heinz, at work on a graceful angel. He explained that for several hours, he’d done the initial shaping with an electric saw. 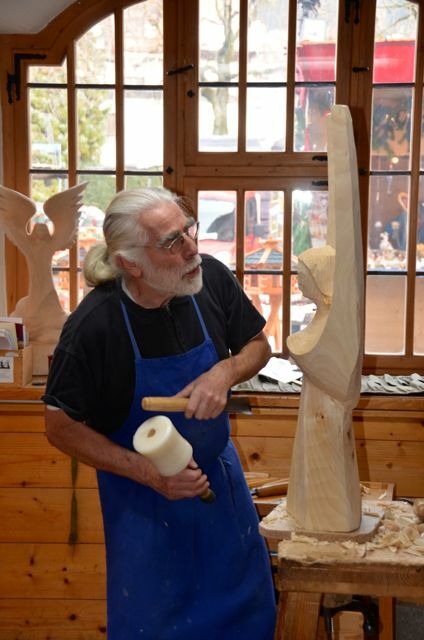 As Karl Heinz chiseled away at the angel’s features by hand, he mentioned that he loved that his non-technical job allowed him to live in such a peaceful region as the Ammergauer Alps. 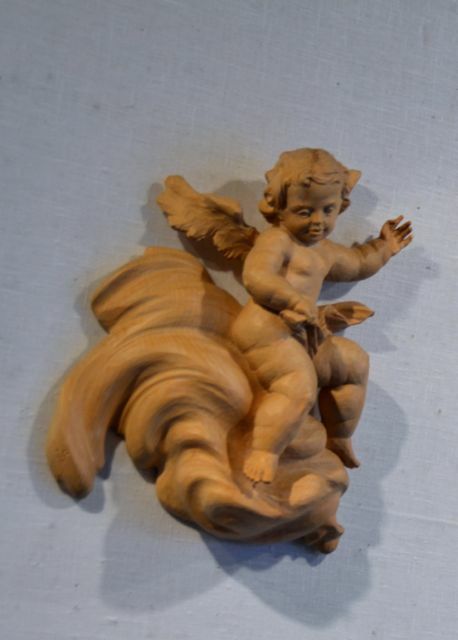 When I heard the great number of hours needed to complete just a reasonable-sized piece, it helped justify the hefty prices I’d seen tagged on woodcarved figures in Oberammergau shop windows — generally hundreds of dollars/euros. 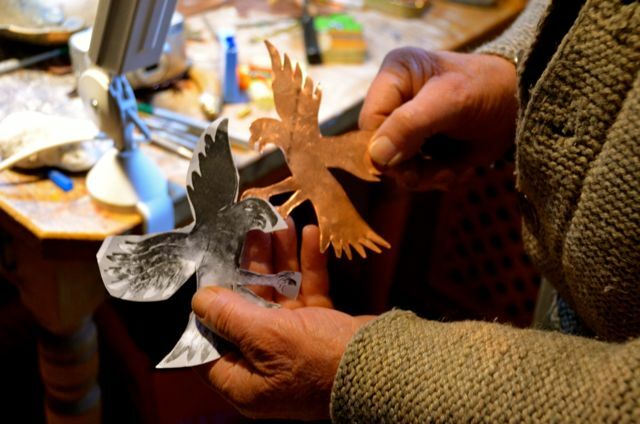 Next, we observed coppersmith / Kupferschmied, Josef, showing off his skills on a piece of copper destined to be transformed into a regal eagle. 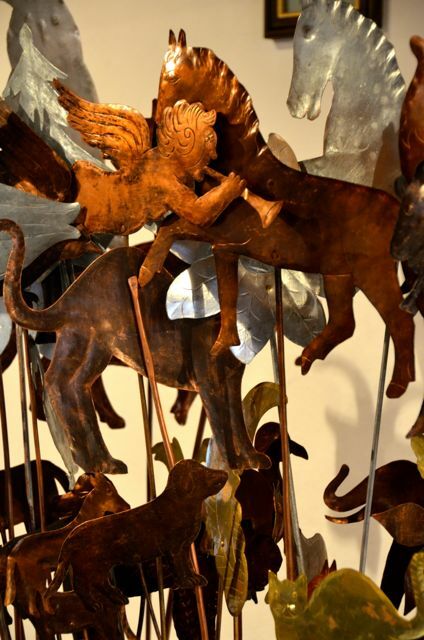 Brass and copper horse, angel and dog figures on garden stakes looked on. 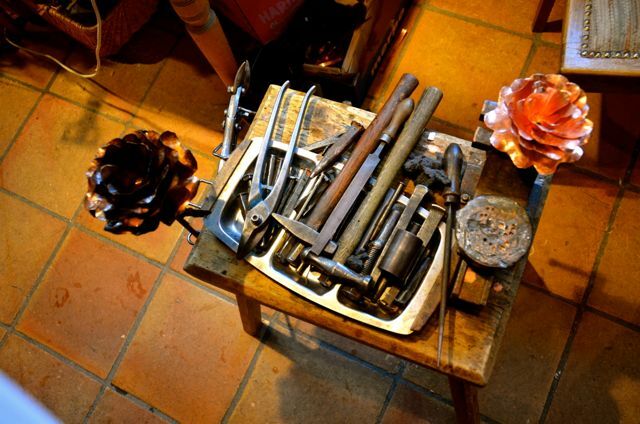 Looking at his work table, I found it remarkable that such delicate items – including the petaled roses prominently featured – could be fashioned from such rugged tools. Quite the social butterfly, Josef insisted on taking pictures with his American onlookers. 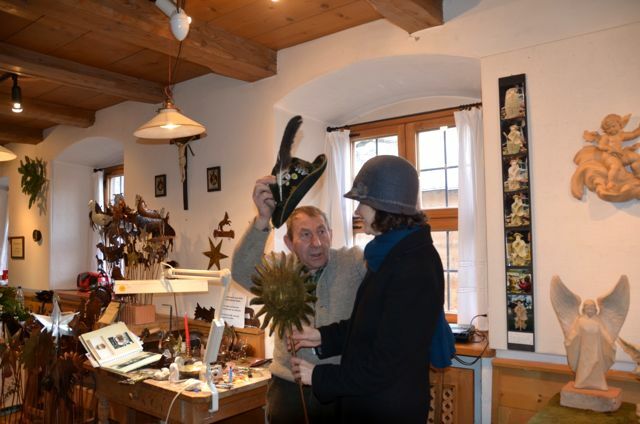 He even mischievously took off his Bavarian hat and swapped it with mine. Posing with the coppersmith’s creation after having swapped hats. After the impromptu photo session, Josef kindly gifted me with a copper bracelet, which he fashioned before me and placed on my wrist. 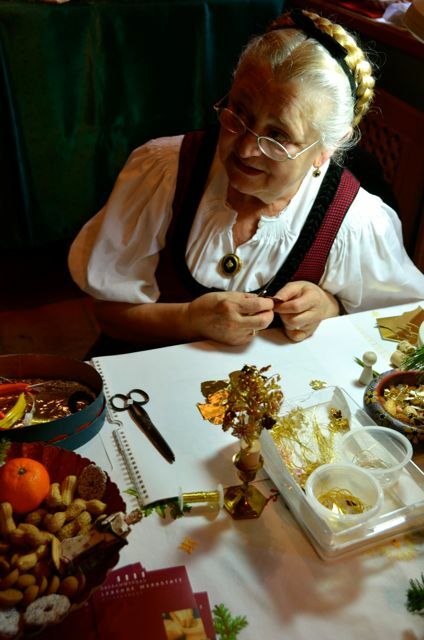 Our last informal lesson was with embroiderer / Stickerin, Coletta, who sported an elegant Dirndl, upswept golden braid, and accessories with Bavarian flair. 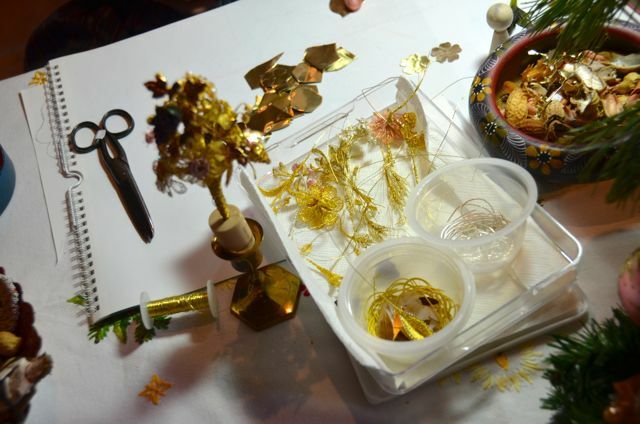 Coletta makes elaborate decorations for monasteries and private buyers using fine, gold metallic thread. 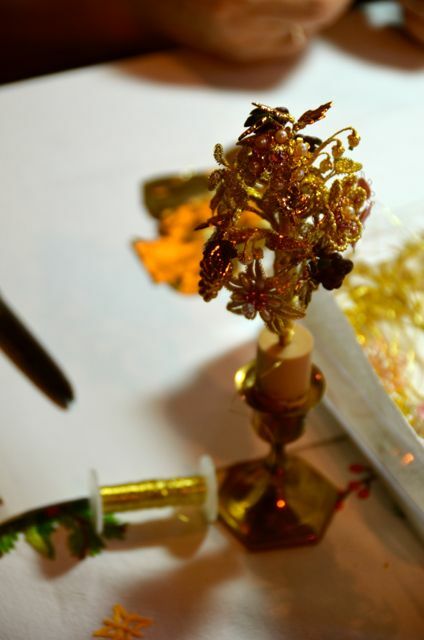 One floral creation in progress sitting atop her table had already taken twenty hours to create. 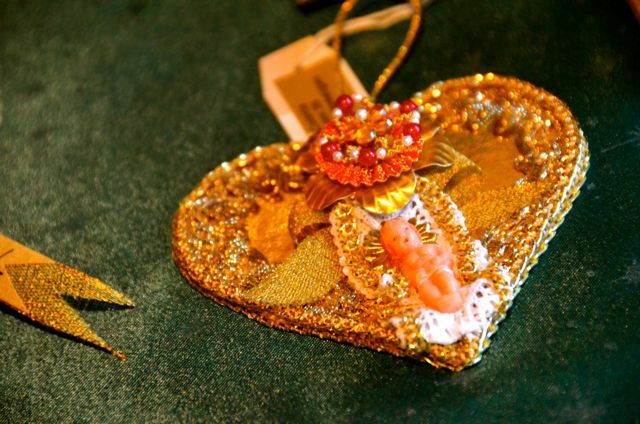 An intricate Christkind display – featuring a wax figurine of a ‘Christ child’ adorned in gold – was priced at more than 500 euros (nearly $700). We left the exhibition with a greater appreciation of Oberammergau’s artistic heritage, and the desire to get creative ourselves. Perhaps follow-up lessons with Josef, Colette and Karl Heinz are in order! 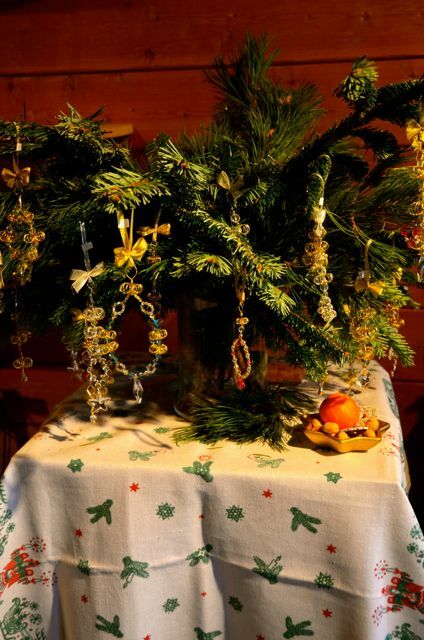 The exhibition – referred to as ‘die Lebende Werkstatt‘ (the ‘living workshop’) is housed in Oberammergau’s Pilatushaus at Ludwig-Thoma-Strasse 10. Their telephone number is 08822-949511. Check the website for current exhibition dates. Admission to the workshops was free when we last visited. Visit my Germany page for more trip tips. 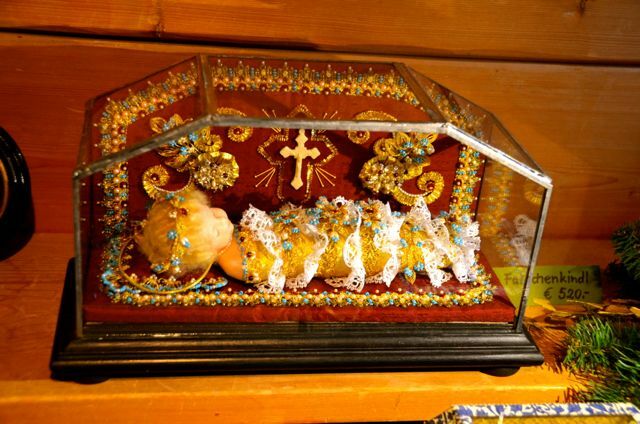 If you’re seeking more ideas about what to do in this part of Bavaria, here are all my posts about Oberammergau. Wow! Simply stunning photos of such amazing art. Thank you, Eclecticlamb. It was a joy watching talented souls at work. Very true, Anyes! Watching them was a great inspiration for me to revisit some of my favorite activities. What are some of your favorite activities/hobbies? Wow, very interesting and beautiful. Love the hats! We frequently spot some residents sporting hats like this when we’re out and about. 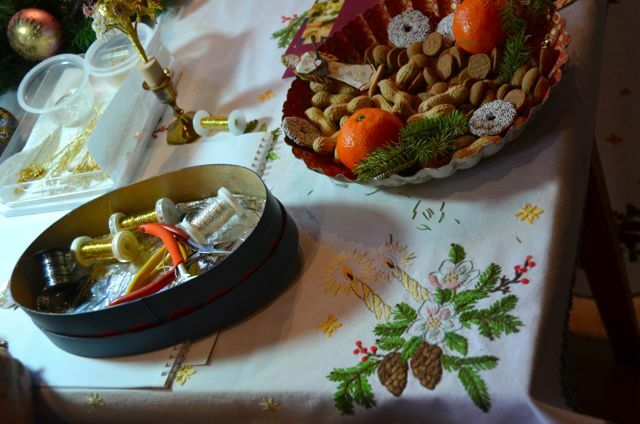 It’s great to see that so much tradition is still alive here. This is a delightful post, Tricia. As always, the perfect blend of travelogue, culture and personal. I am glad to see traditional craftworks being sold for prices that reflect the lifetime’s skill and work put into them. 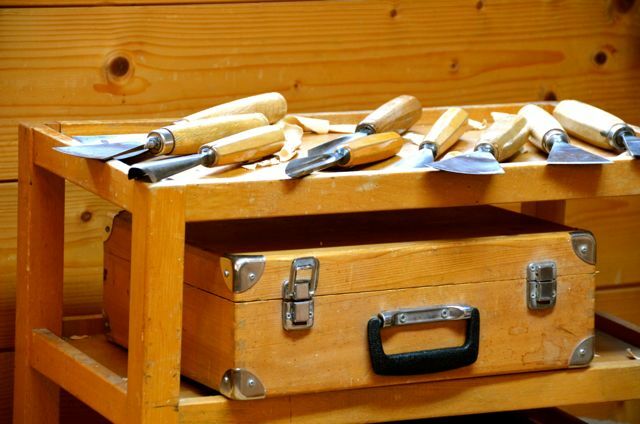 I think often these days crafts are undervalued – we all want them but tend not to expect to pay much for them. What a kind thing to say, Rachael! I do aim to provide a blend of all three. You’re spot on about the prices artisans deserve for their work! 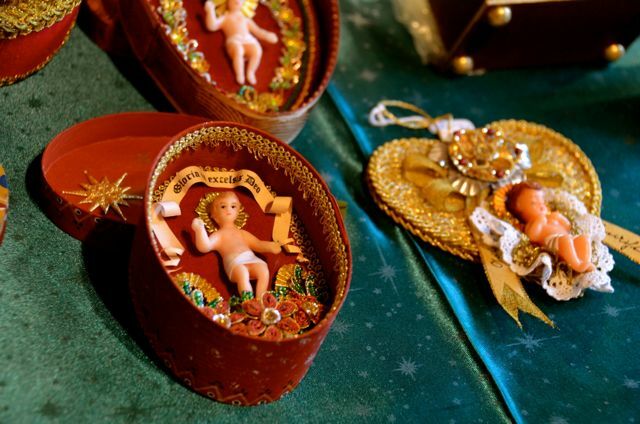 I wonder how many people today would have such patience to devote to these crafts? Hopefully it will not be a lost art. Tricia this is so a wonderful post. Good Husband and I put our heads together to share this post. Every photograph was a delight. V.
Virginia, thank you to you and your hubby for letting me know that you enjoyed a glimpse into the artisans’ workshops! Knowing you, I have a feeling that the post inspired you to delve into some of your many creative projects. 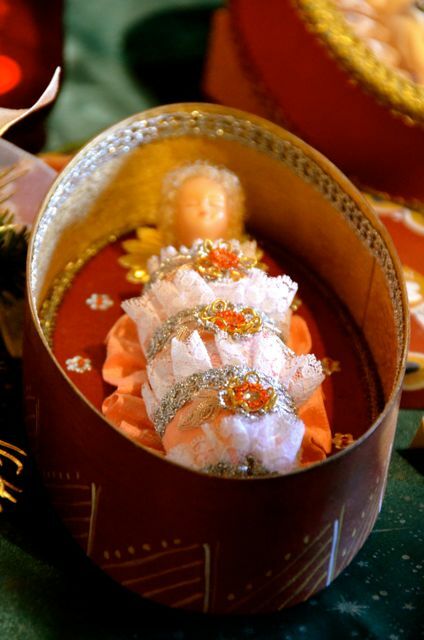 What divine craftsmanship. True artists in their own right and who will they pass this on to? It is so difficult to make a living but I admire those who do. 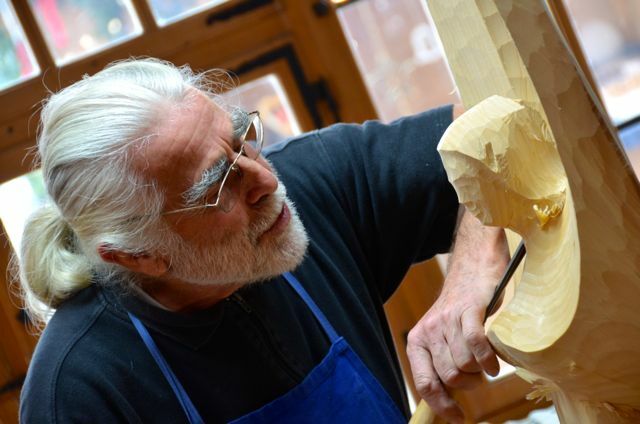 There is nothing like watching a woodcarver using mallet and chisels. Lynne, I agree with you wholeheartedly! 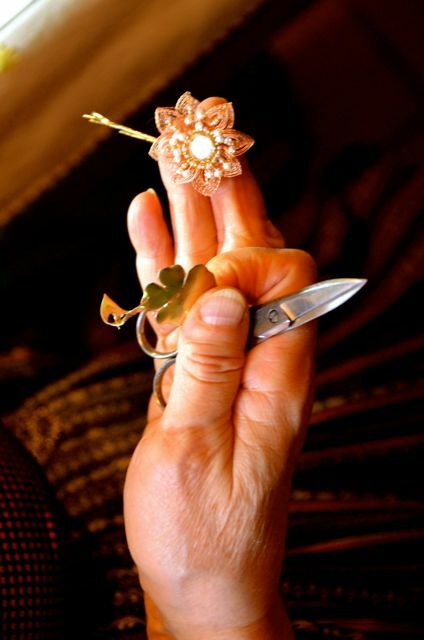 Tradition seems to be kept alive here in many ways, so I hope that generation of artisans that we observed will pass on their skills. 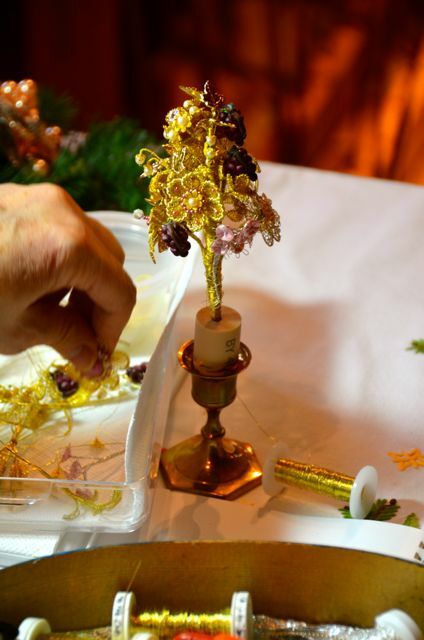 Great post and great to see craftspeople at work. Happy to hear you enjoyed it, Mark! 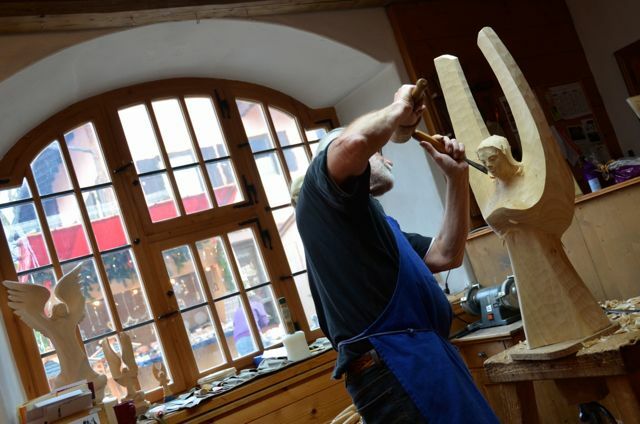 Here in Oberammergau, the woodcarving shops are plentiful, but the finished product means a lot more when one knows how much work has gone into its production. What patience the artisans have. What a wonderful post! I love all the details of craft work. The pictures are beautiful. Glad you enjoyed it, Judy! 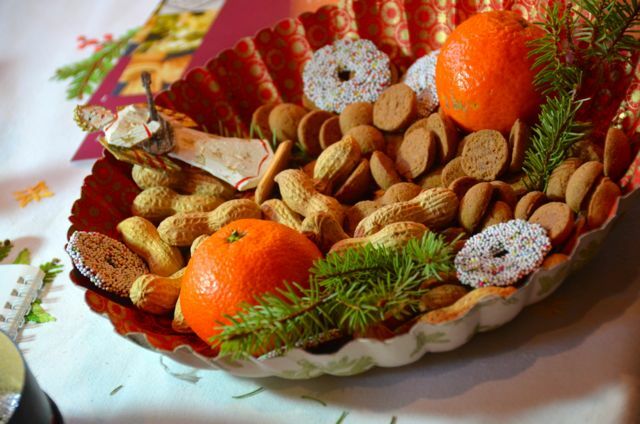 Being the avid baker, you probably would’ve loved the Spekulatius cookies they had to sample. Being gluten-free I couldn’t give them a whirl, but they looked tasty. 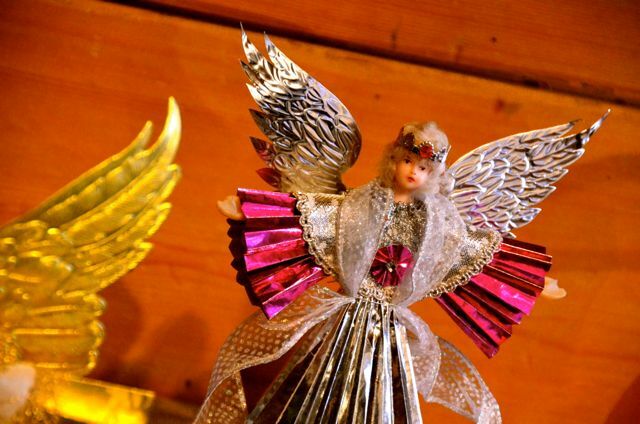 What a fascinating place to visit and beautifully illustrated here by your photos. Many thanks, Kat. I’m so glad to have family here so that we can visit during different seasons. Very well captured Tricia, those artists are quite characters, their art is just beautiful and they are just so dedicated to what they are creating This is all part of my childhood. Thank you, Cornelia; I’m glad the post brought back memories from your childhood. 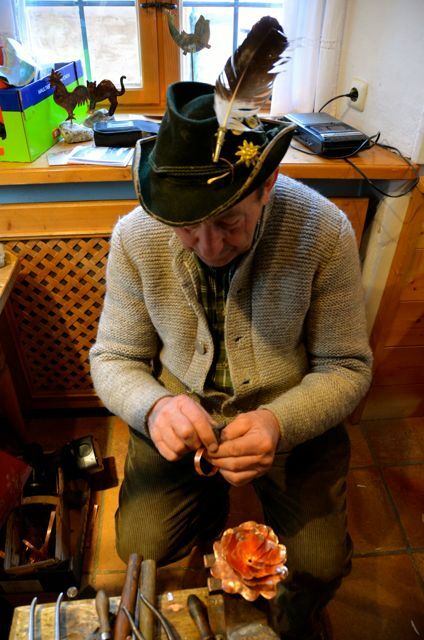 I’m curious – did you learn any traditional Bavarian crafts when you were growing up? Such wonderful artistry, Tricia, beautifully captured. What a delightful way to spend an afternoon! Your pictures are absolutely gorgeous. Thank you for sharing Tricia. And it was made even more lovely since I spent it with my mother. 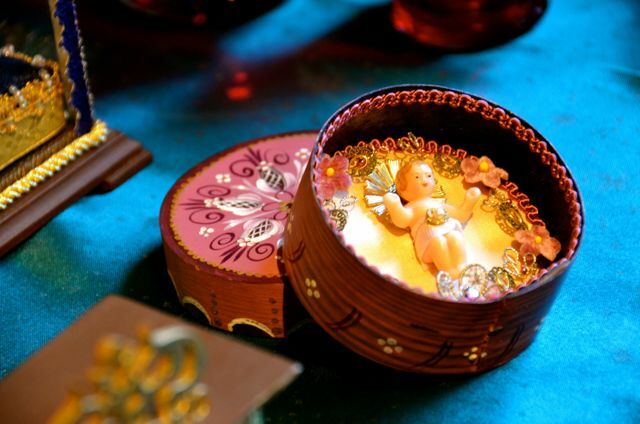 :) Glad you enjoyed a glimpse of the artisans at work, Madhu. 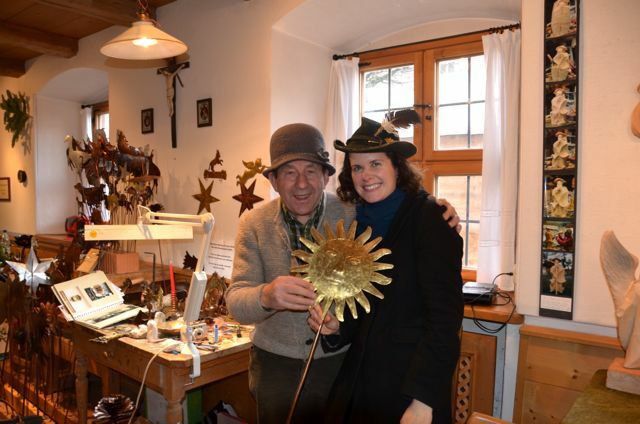 You’ll have to come to Oberammergau in the warmer weather to see the workshops. How wonderful carvings! I admire the skills of the person who made them. In Finland we make carvings, but not so beautiful. Wonderful post! Ours are very rustic, but we love them.